Earlier today MU released details of the season finale at the Bradley Center on Saturday, March 3 when the Golden Eagles host the Pittsburgh Panthers. Tipoff is scheduled for 8pm CST. Dukie V and Dan Schulman will broadcast the game. Clear your calendars for the day ....... ESPN is bringing in the big guns for the game -- the ESPN Gameday crew will broadcast live from the Bradley Center beginning at 8am CST. Doors open at 8am -- AND THE GIG IS FREE. Details on the Game Day festivities are available on MU's website. 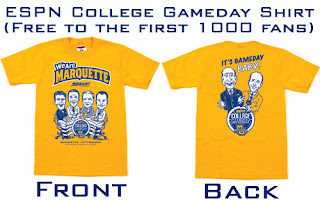 The first 1,000 fans attending Gameday will receive this cool, limited edition gold t-shirt. There'll be tons of prizes and contests throughout the broadcast. For more info, check out the MU Gameday promotional page. MU will provide shuttle bus service from campus beginning at 7am. Back to the game. As you know, MU will honor the 1977 National Champion Warriors at the game. 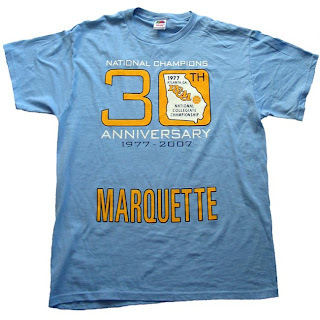 As part of the celebration, MU wants to turn the Bradley Center into vintage 1977 blue. MU is gonna help the fanbase do just that -- every fan attending the game will receive this 1977 blue commemorative t-shirt. This thing just rocks......so, be there and get your game on, MU fans. If you wanna buy one of these shirts, go to the MU store online. One more thing -- the Pitt game is sold out. BUT, anybody can attend the Gameday broadcast on Saturday morning. Again, the event is free and you don't have to present a ticket to join the fun. There is also another 30th anniversary shirt for sale at the GE- more retro looking.